Mmmmmm, chocolate. One of my favourite things ever. However, I do often think a good cannot be improved by being baked – why mess with the perfectly portable and convenient bar of chocolate or do any more than pluck your favourites from an open box? Additionally, with Andrew not being a chocolate fan, there doesn’t seem to be much point to make a pudding or dessert with it, as I’ll be the only one eating it and my incredible greed never allows me to stop at one portion. However, this week on the Bake Off semi-finals was chocolate week, consisting of chocolate tarts, chocolate souffles and chocolate showstoppers with 3D decorations. 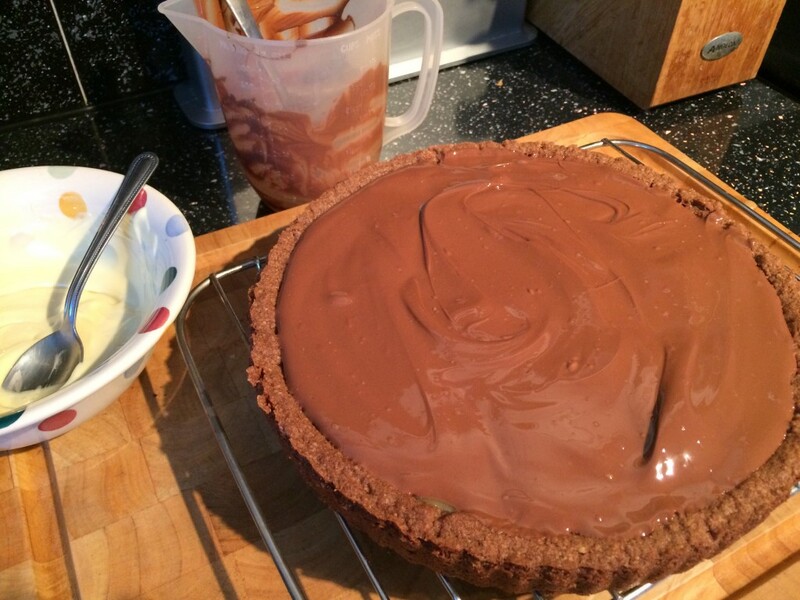 In terms of sheer size the third one was never going to happen, and having never made souffles I didn’t really fancy making those, but I had already made a chocolate tart for the Bake Off a few weeks ago with my chocolate frangipane crunchie concoction. So what to do? Well, I had received a voucher from Stork to buy myself some of their new Stork with butter to try and bake with, so I wanted something buttery to make to test it out. 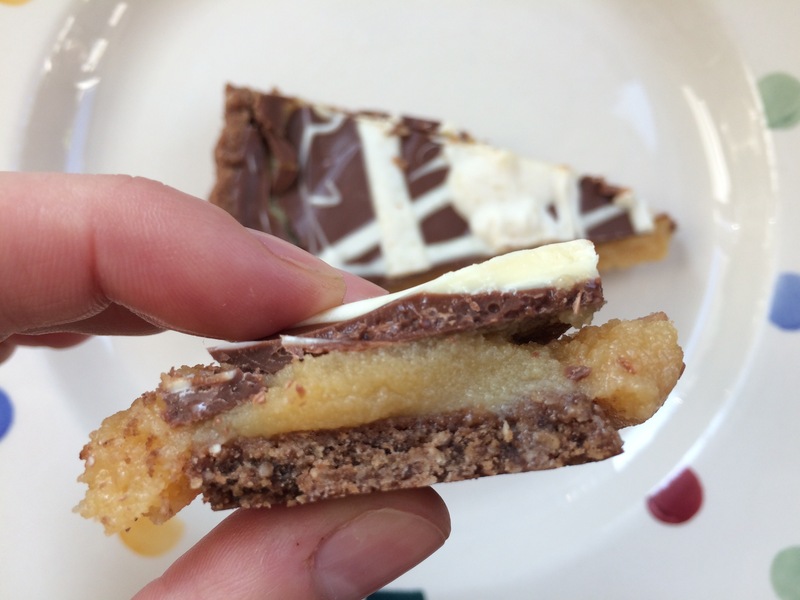 What about millionaire’s shortbread? But the shortbread would need to be chocolate flavour (as the pastry on the show had to be flavoured with chocolate), so I’d need to tweak the recipe I had previously made (a lovely Nigella one). I decided to make the case using a chocolate version of the oat shortbread recipe I have made several times, and although I was a little dubious about using the Stork with butter, it actually turned out really well. 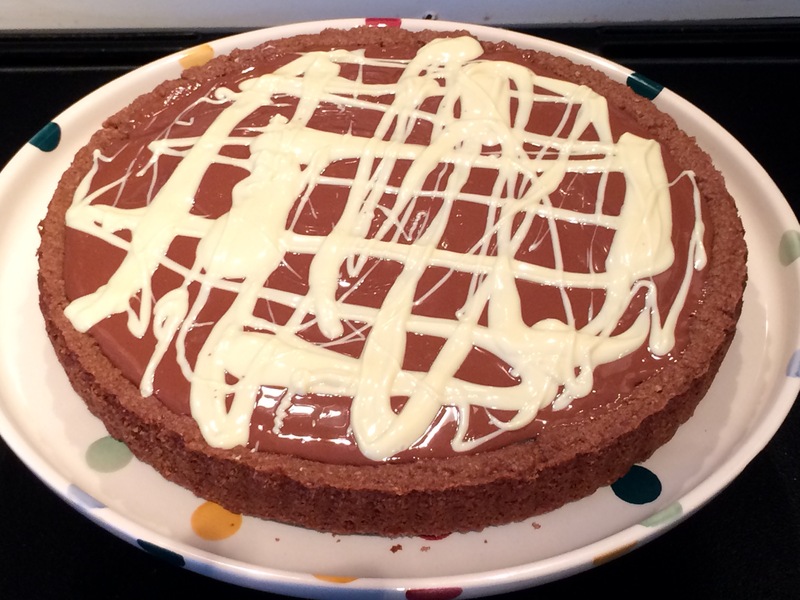 I used half the original recipe, tweaked it a bit from the Rachel Allen version to compensate for the cocoa, and baked it into a tart tin instead of as a biscuit. Due to the bicarb in the mixture the shortbread does rise a little, so when I took it out of the oven I pressed the mixture back down with a spoon and made an ideal space for the caramel. I used condensed milk, Stork with butter and golden syrup to make the caramel, as well as a very generous sprinkling of sea salt to try and temper the sweetness of the caramel and chocolate base. 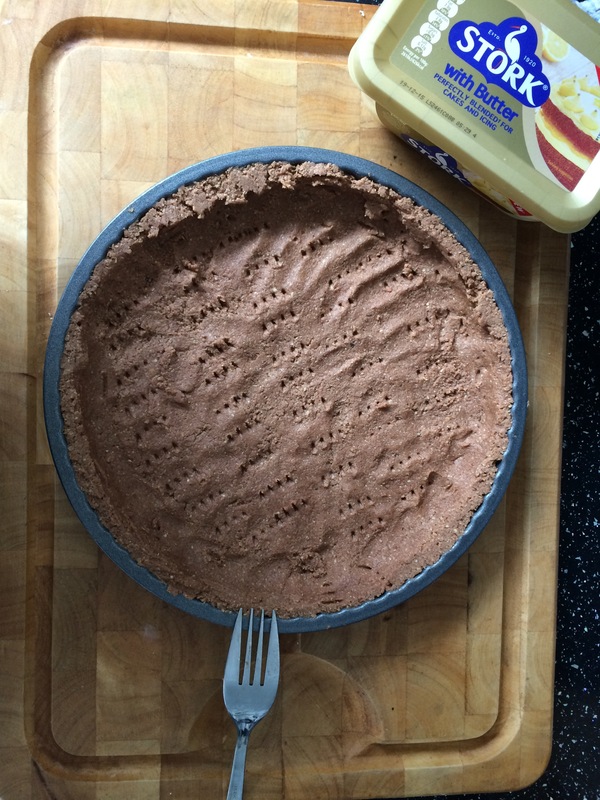 Reading through my previous blog post on the subject, I took my own advice and made the caramel in a saucepan instead of a microwave, and it turned out really well and was very speedy to make. I finished the tart with melted milk chocolate and a few streaks of melted white chocolate, which made it look very pretty. 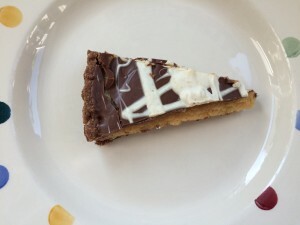 Using a tip from one of my previous commenters, I heated a knife before slicing a piece of the tart and this helped to stop the chocolate from shattering and the caramel from squidging out of the sides. Of course, there was still a bit of mess, but overall the technique was successful, and we were left with beautiful slices of tart. I have to say that this millionaire’s tart was utterly delicious. Short and crumbly pastry which still had the oaty texture and taste, combined with soft and oozy caramel with a hint of salt. 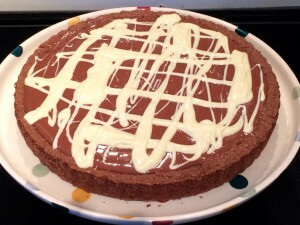 Then the thick coating of creamy chocolate to offer a third texture and taste – just wonderful. 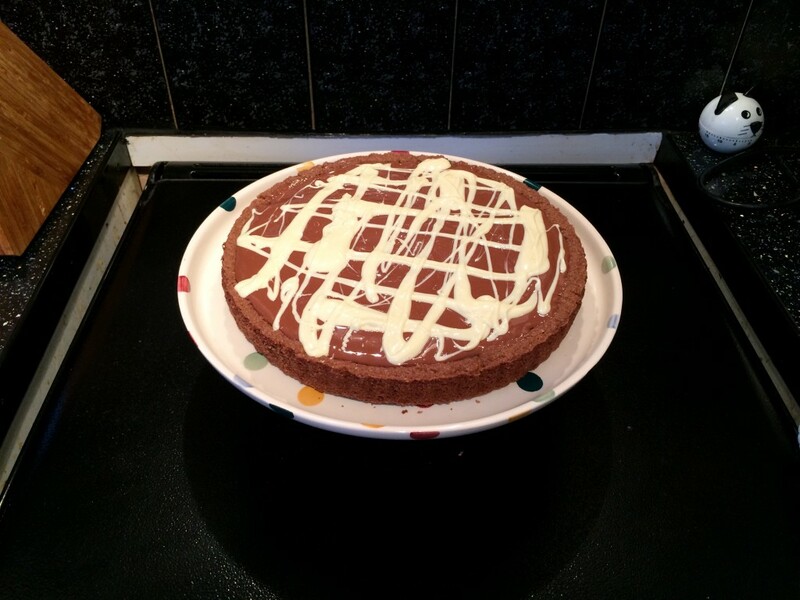 I don’t care that Andrew doesn’t like chocolate – I will definitely be making it again. Start by blitzing your oats in a food processor until they are very fine, then add the flour, cocoa powder, sugar, bicarb and salt and blitz again until evenly mixed. 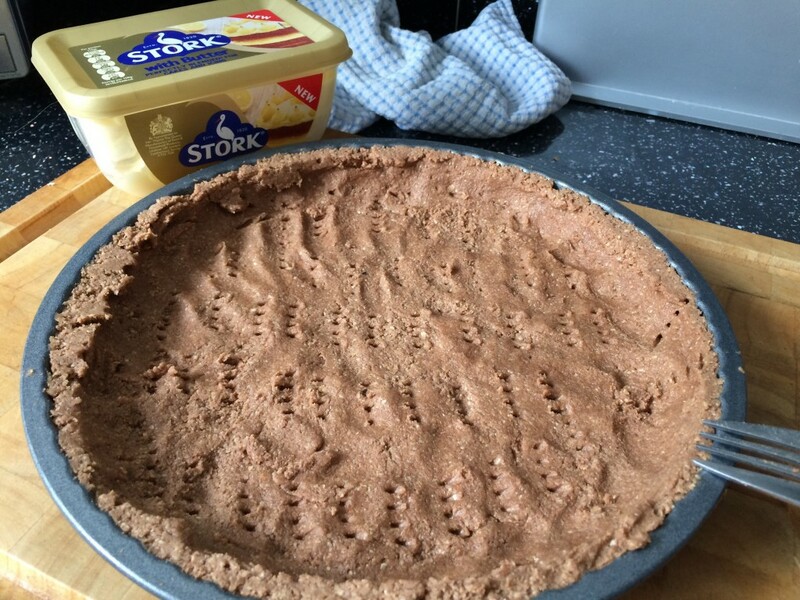 Then add your butter or Stork with butter and blitz a final time until the mixture clumps together into one ball. I used a 23cm loose-bottomed tart tin which I did not grease or line; I simply pressed the shortbread mixture into the tin so the sides and bottom were completely covered in an even(ish) layer of chocolate oat shortbread. Prick the base. I then baked the shortbread at 170 degrees for 15 minutes, removed it from the oven and immediately pressed down the base with the back of a spoon so it was flat again. 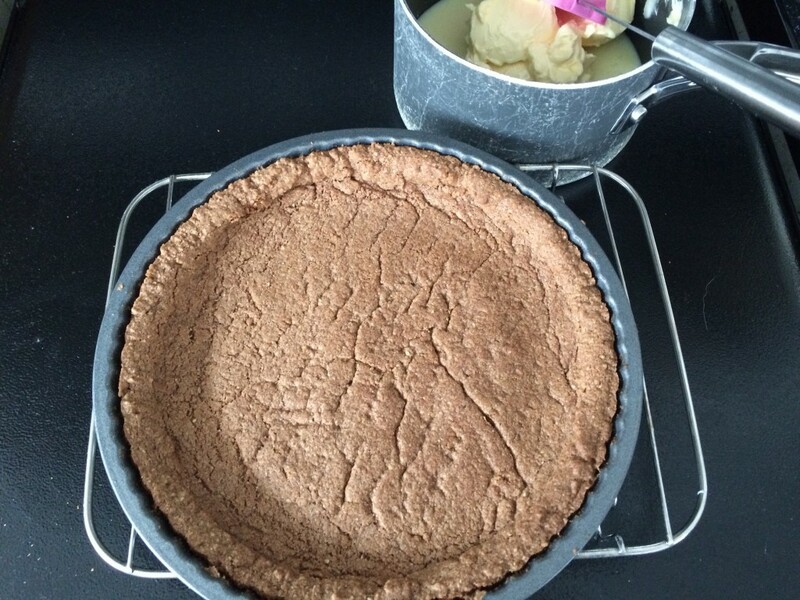 As the tart case cooled further I also pressed the sides in with the spoon to maximise the space for caramel. It’s a very forgiving tart case! As the tart case cooled I made the caramel. Simply put all the ingredients in a saucepan, bring to the boil while stirring constantly and then simmer for a couple of minutes while the mixture thickens (stirring all the time). I am not sure if you are supposed to wait for the caramel to change colour and turn golden but it didn’t seem like that was going to happen any time soon, so I just poured it onto the biscuit base. Do remember this caramel is boiling and will burn you if you touch it or try to lick the spoon. Greed doesn’t pay in this situation. Then melt the milk chocolate. I always use Waitrose Belgian milk chocolate for cooking as it tastes amazing, and I really enjoy eating it too. I broke the 200g bar into pieces and put them (minus one or two for me to munch on) in a plastic jug. I then microwaved the chocolate for just under 3 minutes, stirring every 30 seconds, until the chocolate had melted. I used a separate bowl to do exactly the same with the white chocolate (again I used the Waitrose Belgian brand, but I am not a huge fan of white chocolate so I can’t say if it’s anything special). First pour the milk chocolate onto the caramel and spread it evenly, then use the white chocolate to decorate by splashing it on, or flicking it on, or maybe pouring it on into a swirl? I went for flicks and I think the finished product looked rather lovely, but do whatever you fancy. 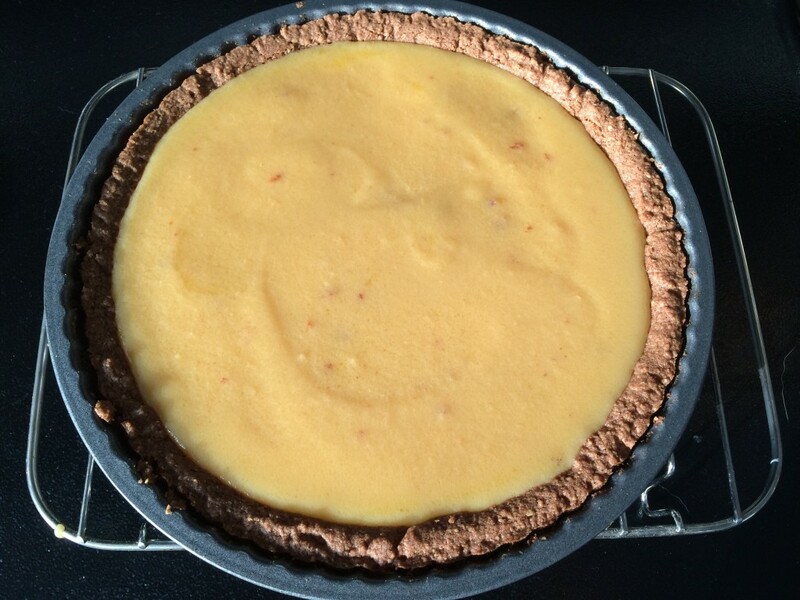 And that’s it – I left my tart to set at room temperature overnight (it’s October now, and cold at night, and we don’t have the heat on yet) but if the weather’s warm maybe store it in the fridge and take out at least 20 minutes before you want to eat it. Slice with a hot knife to minimise breakages, although it’s chef’s privilege to hoover them up whilst you are serving … so, whatever. 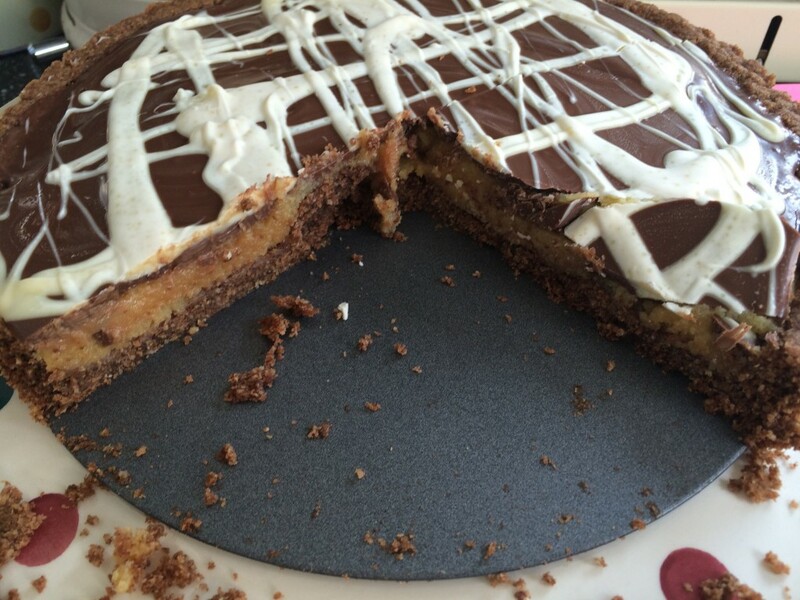 The Great Bloggers Bake Off, this time hosted by the Baking Queen. 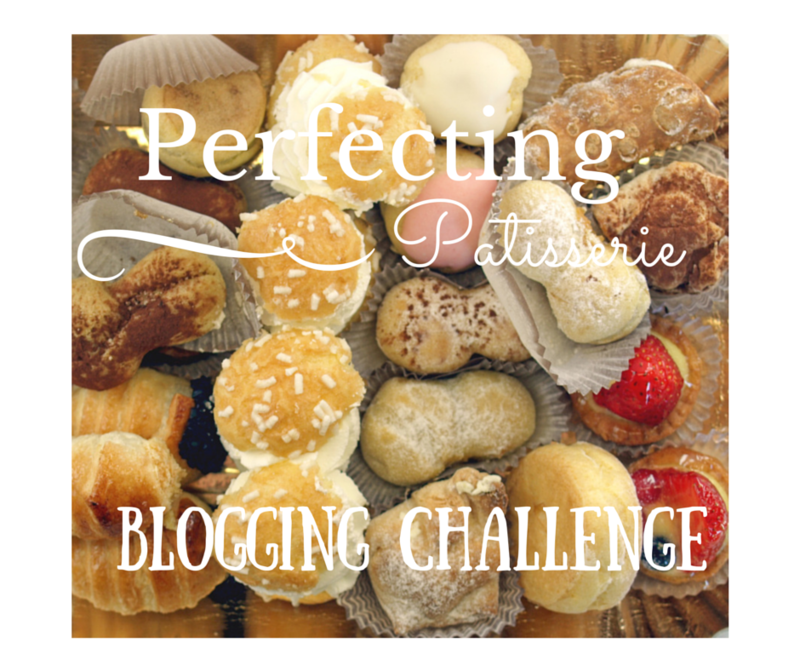 Perfecting Patisserie with Baking Queen 74 as well! I’d happily help you polish that off!! Looks very tasty! With some nice ingredients in there and pretty topping… yum..
Oh my goodness, that looks so good. 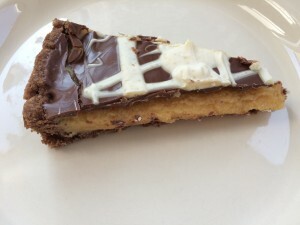 I love millionaires shortbread, and yours looks perfect.